At long last, Election Day is here: VOTE! Today is the day the people of the UK can either make a positive change, ejecting the gangsters and liars who have been running our country into the ground for the last five years – or decide to remain in chains, under the whip hand of the same uncaring gangsters and liars. It’s up to us to make the right choice. This Writer isn’t going to say what that choice should be. If you’ve been reading the blog for any length of time, you’ll know what I would advise. But the choice now is yours. Don’t let apathy stop you from voting. In fact, don’t let anything stop you. Don’t have transport to the polling station? Walk. Don’t have a babysitter? Take the kids with you. Don’t waste your chance to make a better nation. It’s the only one you get. 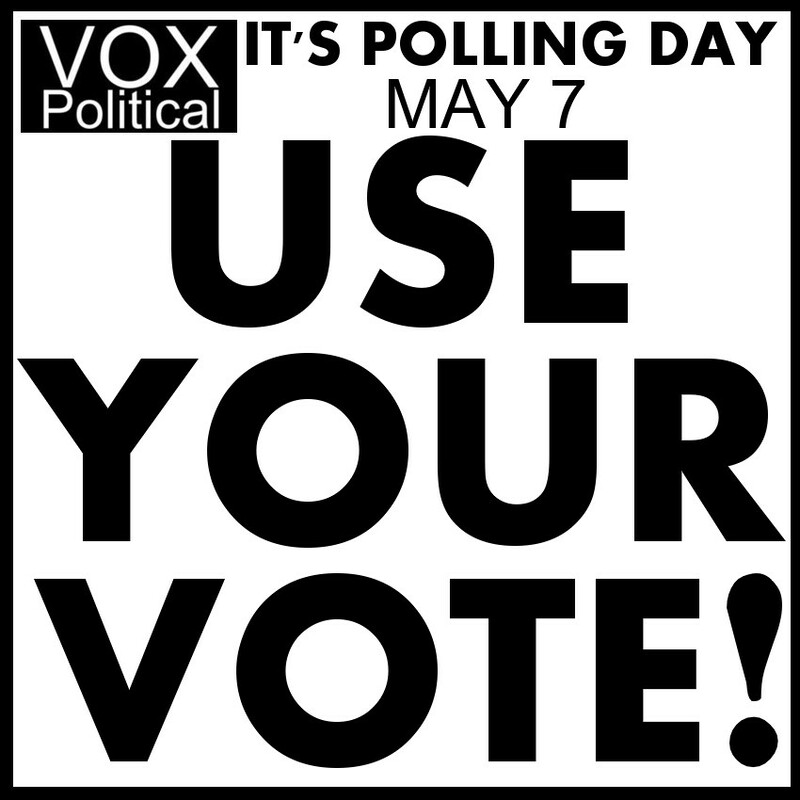 urging you to use your democratic right. Here in the West we have sunshine & showers – a wonderful spring day. We never let a bit of wind & rain keep us indoors, we’re hardier than that. The rain makes everything so gleaming, and fresh, it’s welcome to help wash, clean, and start anew. Let’s hope it inspires many more to go & vote. I voted, had to walk miles for it, but I did. I voted today for my Labour MP,I hope for brighter and fairer future under a Labour government. were severely affected by,however I feel that Labour’s policies were more to our way of thinking. Please use your vote wisely today,your future depends on it. Cannot remember an election when the choice was so important. Foodbanks in the UK!! Please Ed do it! A real chance to being and making the change we want to see towards a kinder, more thoughtful and compassionate and empathic society. Yep, used my vote for Ed and Labour. Been and voted at 7.30am.Quite a few voters there to.Good weather usually helps to get the Labour vote out there.At first I could not see the Labour candidate,it was right at the bottom for some reason. I want Slimy Dave,Giddiot Osborne and Evil Duncan Smith to get their P.45,along with their cohorts.I am pushing sixty and this is the most evil,inept propaganda promoting government in my living memory. We cannot give the nasty party another 5 years,to many people have died on their watch. Stuck at work at the moment, but I’ll be going to the polling station before I go home tonight. As an almost lifelong died-in-the-wool political agnostic/apathete I have finally cast my vote…and it wasn’t for the Tories. This is the time when we can legally kick our government in the bottom if we don’t like it-I certainly voted and will be staying up all night watching it on TV. The more of the Conservative’s little yellow helpers that are voted out, the better.